This final stage of the Cleveland Way is very different to all the others. Almost immediately the path turns its back on the escarpment edge and heads into rolling farmland. Soon it descends to follow a wooded glade towards the ruined abbey at Rievaulx. It's then a short (and seemingly popular) stroll through muddy fields to Helmsley and the end of the Cleveland Way. As the landscape changed, we started to notice more wildlife too. We left behind the grouse of the wild moorland, replacing them with phesants and partridges. Hares dashed across arable fields and deer scampered through the gently wooded slopes. What a walk! 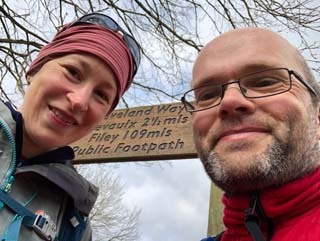 Five years since we started walking this National Trail, we finished it having endured the worst weather we've ever walked through. Surely walking the 109 miles from Saltburn to Helmsley is enough? You'd be forgiven for thinking so, but we've still got half a week to go. Tomorrow we start another walk, another National Trail, and with Filey as our destination. Let's hope the weather plays along. Posted by pab at 12:25 | Comments will be back one day. Please email me instead!